A group of graduate students from the Rhode Island School of Design Interior Architecture program will be touring the recently expanded Watson Institute at Brown University as part of their thesis course work. In conjunction with the tour, Stephen Turner will offer a lecture on building codes and envelope assembly details. The concepts presented will be seen in action in the advanced energy efficiency strategies and commissioning process implemented on the Watson Institute project. 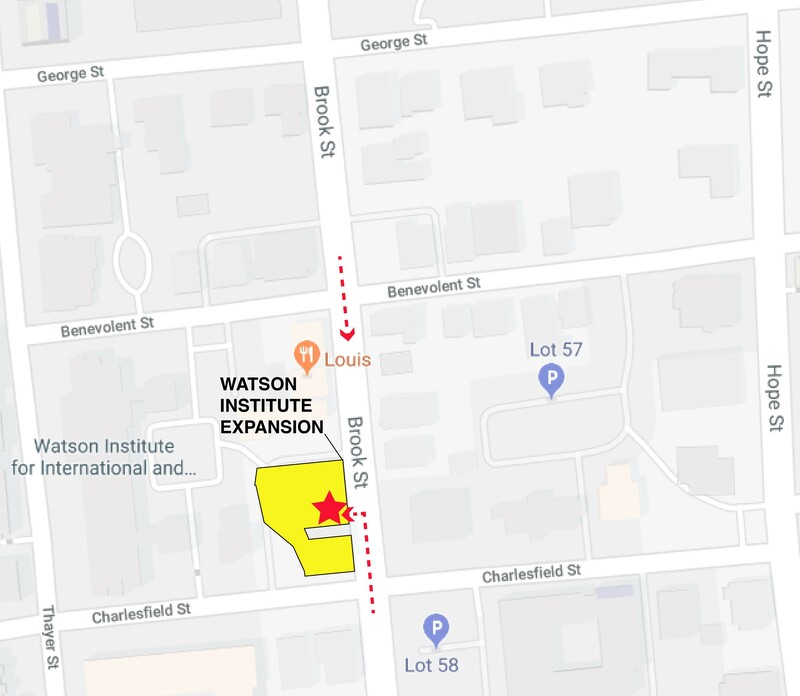 Come join us on Thu, January 17, 2019, 5:30 PM – 6:30 PM EST, for a free training and tour of the Brown University Watson Institute of International and Public Affairs building. 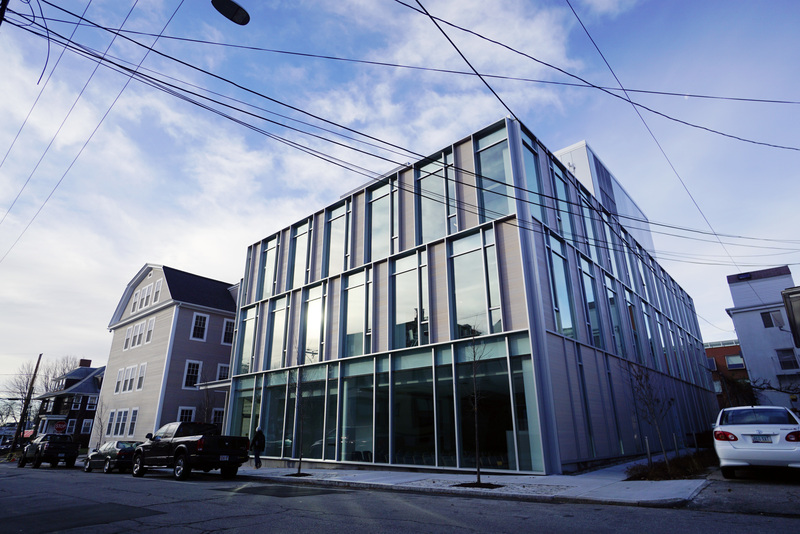 The project consisted of renovating the existing building and the new construction of an addition at 280 Brook Street. This mixed-use facility is 31,000 square feet. The existing wood framed structure was renovated into a three-story plus mezzanine building and a steel framed, curtain-walled, three-story plus penthouse addition, housing offices, meeting spaces, a large classroom, cafe, and a three-story multi-function atrium space. The expansion project was designed and constructed to meet the University’s requirements that the project reduces energy use by at least 25% (31% realized) compared to current energy codes. The project will comply with the requirements of LEED v4 BD+C New Construction and Major Renovation and is currently pursuing LEED-NC Silver certification. HAPPY HOLIDAYS FROM ALL OF US AT STEPHEN TURNER INC. 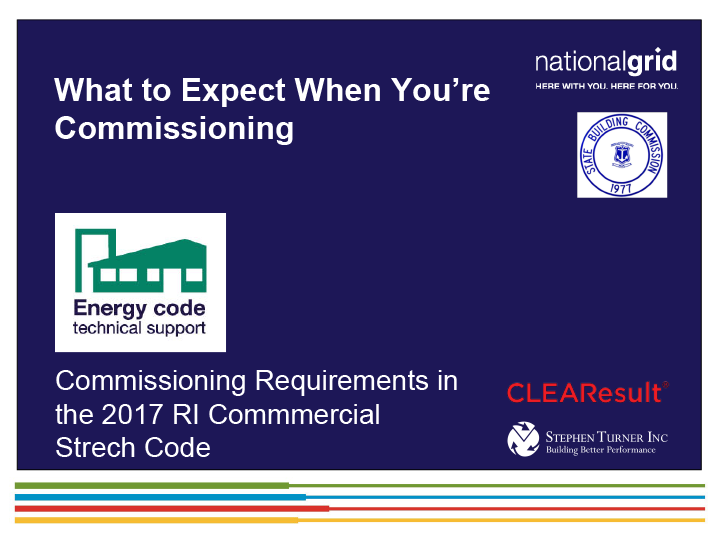 Please join us for a free training on building commissioning and the Rhode Island Commercial Stretch on Wednesday, November 7th at the Viessmann facility in Warwick. This workshop will highlight how building commissioning supports Owner’s energy conservation goals across all commercial buildings from smaller simple buildings to high-performance complex buildings. During this workshop we will discuss actual project case studies highlighting how the commissioning process was executed and how it met the energy efficiency code requirements at each step along the way. Continuing Education hours will be available. Stephen Turner Inc. hosted a delegation from the Japanese Building Services Commissioning Association last week. Fifteen members of the Japanese commissioning organization traveled to Cambridge, MA, where they toured two major construction projects with city representatives and the Stephen Turner Inc. team, focusing on the City of Cambridge net zero schools initiative, energy-saving project elements, on-site renewable generation, local construction techniques, and best commissioning practices. The site visits were followed by a symposium on best commissioning practices, competing in a commoditized commissioning services marketplace, and the state of the US commissioning industry. Stephen Turner, president of Stephen Turner Inc., has been invited to lecture on best commissioning practices in Japan in September 2020. Rhode Island! Come out tonight and join us for a drink and some great conversation as Stephen Turner Inc. hosts the Providence Building Commissioning Association (BCxA) May social event at Bayberry Beer Hall from 5:30 – 7:30pm. Your first drink is on the BCxA! 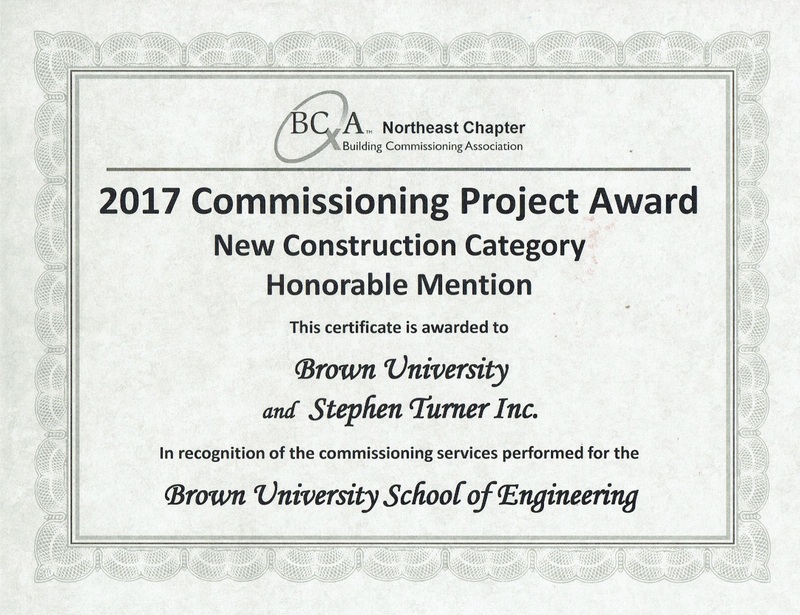 The Building Commissioning Association Northeast Chapter awarded Stephen Turner Inc. an Honorable Mention in the New Construction Category of the chapter's 2017 Commissioning Project Awards for the Brown University School of Engineering project. The award was jointly presented to Brown University and Stephen Turner, Inc. in recognition of the commissioning services performed on the project and the owner's commitment to the commissioning process. Stephen Turner Inc. performed LEED Fundamental and Enhanced Commissioning services on Brown University's School of Engineering Project and commissioning was an integral part of the Integrated Project Delivery process and the project’s success. The MIT W34 Johnson Ice Rink Chiller Replacement Project consisted of the demolition of the existing DX refrigerant brine chiller and the installation of an anhydrous ammonia refrigerant (R-717) brine chiller, ventilation system, and an ammonia detection system. Stephen Turner Inc. commissioned the new chiller, ventilation system, and ammonia detection system, wrote the Standard Operating Procedures (SOP), and documented the sequences of operation and setpoints for these systems. This ammonia chiller was the first of its kind at MIT. Stephen Turner, president of Stephen Turner Inc., and Gary Hebner, senior project manager and electrical lead, have earned Certified Commissioning Professional certification from the Building Commissioning Certification Board. As the only two registered CCPs in the state of Rhode Island, the certification is an affirmation of their experience and expertise in executing all aspects of the commissioning process. CCP certification is the standard for commissioning providers, and is accredited by the American National Standards Institute (ANSI) and recognized by the Better Buildings Workforce Guidelines Program.